Dear Santa, I know I have not been in touch for a while. I have really tried to be good this year, and I hope you have seen it too. 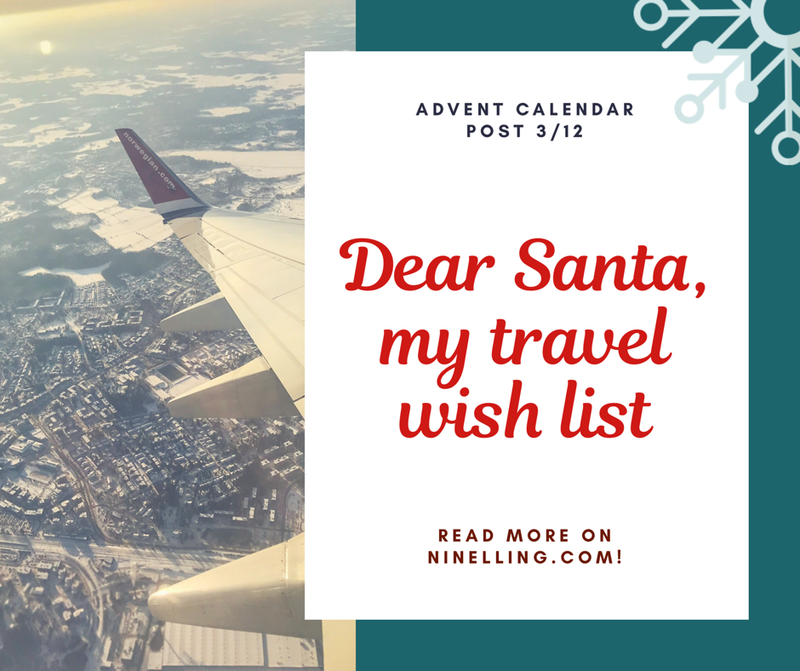 Therefore, here is my travel wish list for this Christmas. This is the third blogpost in my Advent Calendar 2018! Santa, I know a lot has happened this year. Even my prediction was that I would have one of the best years in my life, and I really have had a great year so far. I got back home to Finland from my exciting exchange in Seoul. Then I took the summer off and I know, I know, it was not good at all for my wallet. But I got to experience a lot of great things in Rome, Pisa, Genoa and Nice! And let’s face it, I needed a break after all those years of studying and working and not having a proper vacation for such a long time. And I moved to Stockholm to work! I do feel at home here. Trying my best at work and updating my blog whenever I have time and have experienced something fun and worth sharing. I know some of the places are quite far away and some are a bit closer – and some are more specific than others. The fact is that for some destinations I would just be happy to visit any place, while some others I want to visit that city specifically. And you know that London is always on the list, as my favourite city so far in Europe. Top of the tops is really New York. But I do need to save a lot of money to be able to go there as I want to experience a lot there as well. So a little help for that would be much appreciated. Thank you, Santa, for listening. Any other tips on where I should go next? !